My hubby was at work literally all day long yesterday. He left at 7 am and was home at 9 pm. I wanted to make him a special dinner to help him just relax when he got home. One of my hubby’s favorite types of food is Chinese. I can honestly say I had never made a Chinese meal before yesterday. My idea of the perfect meal in Mexican, probably why I have so many dishes of it on here! I decided to take on the project of making Chinese and the finished product was pretty tasty! It did take time though, but seeing as he didn’t get home until late, I had plenty of it haha! I had heard about this recipe and decided to give it a try. here’s the recipe:CHINESE HONEY CHICKEN1 ½ lbs boneless skinless chicken breasts (cut into 1” chunks) Oil (for deep frying) BATTER 4 tablespoons cornstarch ¼ cup flour 1 teaspoon baking powder ½ cup water ½ teaspoon salt 1 egg 1 egg white SAUCE:1 ½ tablespoons oil 2 teaspoon ginger (minced) 3 tablespoons garlic (minced) 1 teaspoon salt 3 tablespoons honey 1 teaspoon rice wine vinegar ½ cup water 1 teaspoon cornstarch (mixed with 1 teaspoon water) Sesame seeds (for garnish)1. In a large bowl mix all batter ingredients together until smooth. Cover and allow the batter to site for at least 30 minutes. Add the chicken to the batter tossing to coat.2: Heat a deep fryer to 350 degrees. Fry chicken bits in patches for 2 minutes or until batter becomes firm. Drain on paper towels.3: To make the sauce. Heat 1 ½ tablespoons of oil in your wok. Add garlic and ginger and stir fry for 30 seconds. Add salt, honey, vinegar, and water. Mix well. Combine 1 teaspoon of water with 1 teaspoon of cornstarch. Add to the sauce and Simmer for 2 minutes.4: Coat chicken with the sauce and garnish with sesame seeds. Serve with white rice.Enjoy! Linking up to these fabulous parties! That looks so good I would love if you share it at my party. Looks delicious! My husband grew up in China and LOVES Chinese food. Thinking this would be a nice surprise sometime! This looks so good. makes me hungry! This sounds delicious! Thanks for the nice comment on my blog. I'm looking forward to poking around yours! I love both asian and mexican too! This looks great! This looks delicious! Thanks for sharing the recipe. I'll have to give this a try. That looks incredible! We've attempted Chinese food a few times but we always fail. We'll have to try this. Looks so good! I've seen a similar recipe floating around pinterest and I pinned it to try it out too. Great minds think alike! Oh my goodnes, your blog is going to get me in some serious trouble with my waistline! Everything on here looks great! Thanks for your sweet comment on my blog. I will definately be following you back! This looks positively delicious! My mouth is watering even though I just ate dinner and am stuffed! This will be on next week's menu! Oh my!! This looks so good. I will have to try of these delicious looking creations. Thank for visiting me over at Yards and Yards!! Wow, I couldn't stop reading your recipes, they all look so delicious! I'm "following" you from the blog hop and would love a follow back. Thanks! This looks delicious. I love Chinese food! Thanks for checking out my link today and for following my blog! I signed up to follow yours, too! Hi Nikki! Thanks for following me, I'm following back! yum---this looks delicious. Wow, your blog is RAD - the recipes are all photographed wonderfully and the recipes so detailed..thanks for sharing. thanks for visiting my blog and for following me - I am here and have returned the favor. Have a great week. I will be back to lift some more recipes. Wow! This looks great! I love Chinese but have no idea how to make it at home! I'm definitely trying this out next week! Thanks for stopping by my blog and have a good one! I'm now your newest follower! This looks delish! Thanks for visiting my blog Sunrise Ridge Farm and I am a follower and Twitter follower here now too. Love your recipes! Thanks for stopping over and following - I've followed you back on GFC, Facebook & Twitter! I am looking forward to reading more, I love to find fellow foodies! I was delighted to find your comment on my blog leading me to your delicious site. Thanks so much for stopping by. OOO YUM!! this looks great! my husband and I LOVE chinese food! thanks for the recipe and thanks for stopping by my site! :) Following you now! Delicious. What a great dinner item. Mmmm...my girls and hubby would love your honey chicken! Definitely a must-try recipe! Delicious! I love chinese food! You have some great recipes on your blog! Yum this looks so good!!! 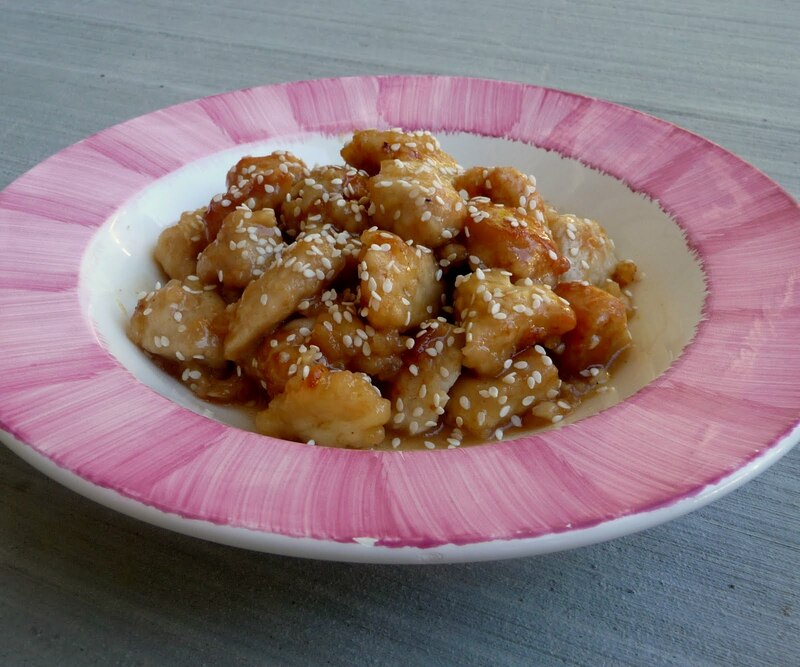 Honey Chicken is one of my favorite dishes, and I love making my own chinese food. New follower and can't wait for the next recipe. Following you back...this looks amazing. After all it si deep fried. I love PF Changs Crispy Honey Chicken and if this tastes anything like that then I have got to try it. Sounds amazing. Chinese food is always a hit in our house! Delicious dish. One my colleague like to eat Chinese chicken and she is really best cookers. Even we have also baked this dish at my home.